Our time with you was a highlight of our trip. Thanks for sharing your passion for the area and your great spirit. It was truly a joy to be with you. Just a quick note of appreciation. Thank you so very much for the lovely tour of Venice. The girls greatly appreciated your time, enthusiasm, fun facts and great spirit. Thank you for the positive impact you made on our girls- your kindness touched their hearts and ours. The entire film crew was greatly impressed! Think we all cannot wait to bring our families and friends back to Venice for a tour. Looking forward to working with you again and seeing you around the neighborhood. Have a lovely weekend. There is no one more familiar with Venice California than Jeffrey Solomon - absolutely no one. Jeffrey has spent the last three decades walking throughout Venice while acting as a goodwill ambassador for the Venice Community Trust, The Venice Chamber of Commerce and countlesss other community serving non-profit organizations. He knows every street, canal and alley as well as his own palm. There is hardly a boardwalk performer, merchant or restauranteur in Venice who does not greet him by name. Jeffrey Solomon himself, is simply a Venice legend. Who then could better be prepared to share legendary Venice with all of us? just wanted to send you some pictures from 4th of July.....we had such a great time with you and Jeff!!!! Tell him that I said Hi. I hope things are going well over there....here it is raining....wish to be back in CA!!! University started on Monday, so we're back in Stuttgart. Everything reminds me of CA....my room looks like I'm American. :-)) I'm back here but my heart is still over there. Tell everyone that I said Hi. 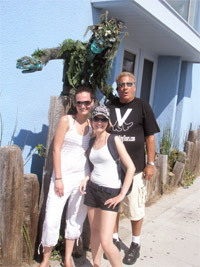 This is to let you how pleased we were with the Venice Beach Walking tour that Jeffrey recently gave us. We had been to Venice Beach on prior occasions, more so as sight seers but decided to learn more of the historic facts and flavors that make the beach such a popular attraction. Jeffrey's fun way of presenting us the history, it's characters and food recommendations were outstanding. First of all, thank you for giving our students such a lovely tour! I was the woman of a certain age in the white hat who is the Dept. Chair (Family and Consumer Sciences) for our group. I got a wonderful video of the blind survivor who sang so beautifully for us. Because I was bringing up the rear, I couldn't quite hear all of her history and her name. Would you be so kind as to share that with me? I am currently the President of the nation-wide Council for Administrators in Family and Consumer Sciences. For those who arrange study tours to LA, I'll be happy to recommend you. On day 6 of an 8 day study tour, our students were really tired and not so responsive, but you keep going with such grace and good humor. I also appreciate how concerned you were for the safety of our students. They are really beautiful and do create quite a stir wherever we go. Imagine what it is like when I take them to Italy! I know you have corresponded with one of my faculty who so beautifully detailed the trip, Elisabeth (Isn't she fantastic! ), but wanted to thank you personally.